Finding it difficult to train or handle your small dog when you go on a walk? Or you just need an elegant walking aid for your small dog? We have a solution for you! All you need is a dog harness for your little friend. You can say bye to collars that might hurt your small dog. The trainers and vets also recommend using a harness for your small dog as a replacement for a collar. A dog harness will reduce the pressure and strain on the neck of your small dog by dispersing the pressure above a wider area of dog’s body which is more secure than using a collar. The small dogs might slip their collars but a harness will keep your Poodles, Yorkshire Terrier, Shih Tzu, Pomeranian, Dachshund, Chihuahua, Miniature Schnauzer, Pug, Maltese, Boston Terrier secure and safe. However, finding the best dog harness for your small dog is a bit confusing and frustrating. But you don’t need to worry! To make it easy for you, we have listed the top 5 best dog harness for small dogs. Have a look below! The Front Range Harness by Ruff Wear comes with a front leash attachment and a 4 point adjustment that is ideal for your dog’s everyday adventures. You have the option to adjust this harness up to 4 points according to your as well as your dog’s convenience. In addition, this harness is really easy to put on to your small dog and take off. The product dimensions are 14.2 x 11.4 x 0.2 inches and weigh only 5.9 ounces. 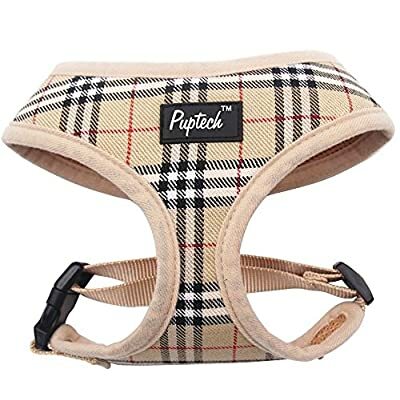 Above all, being extremely comfortable and lightweight to wear, it is a great alternative for collar providing all-day comfort to your small dog as the chest and belly panel is padded. The soft padded belly and chest evenly distribute the weight when your dog is walking or running or even at rest. Furthermore, the strengthened webbing in the chest pulls up and gives additional control having an aluminum ring at the back. This harness not only makes a stylish and comfortable walking aid, but it is also ideal for training your little dog. Your small dog won’t get lost ever as this harness has a pocket for ID where you can put the tags with name, address, and phone number. Lastly, it is loaded with many convenient features like a reflective trim on the bright fabric which enables you to see your small dog even at night. This easy wear dog harness By Kurgo comes with great adjustment options with 5 points for a perfect fit. The Weinerlock quick-release plastic buckles make it very simple for you to put on and off this harness on your small dog. Moreover, having a front D-ring is used as a leash attachment for no pull training your small dogs. This feature will make your dog turn around when you try to pull. It also has back leash ring. The product dimensions are 9 x 4.5 x 0.2 inches and weigh 8 ounces. 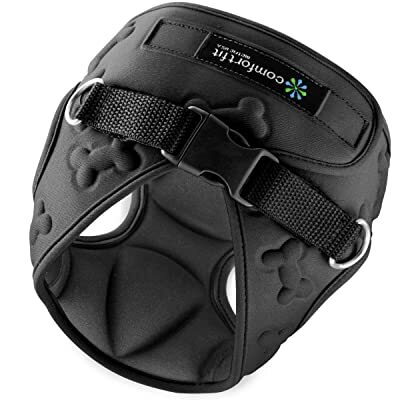 Furthermore, the padded chest plate of this harness will make it comfy to be worn all day by your dog as it gives relieve by reducing sternum and trachea stress. It is not it! If you are distracted while driving with your dog, then this Tru-Fit harness is the best thing to buy. It comes with car seatbelt that is 10 inches long. This harness is available in black color only and comes in much range of sizes. All in all, it is an ideal dog harness for every day walking to the park or beach. The soft harness by Puppia is an ideal harness for your small dogs. It is extremely comfortable as it comes with a chest belt with D ring leash attachment that is adjustable and a neck rim with fully air mesh soft inner padding. This harness is specially designed for your convenience having an easy neck opening. In addition, the harness is made from polyester and cotton providing your small dog comfortable walk all day long. It is available in many sizes ranging from X-small to X-large. 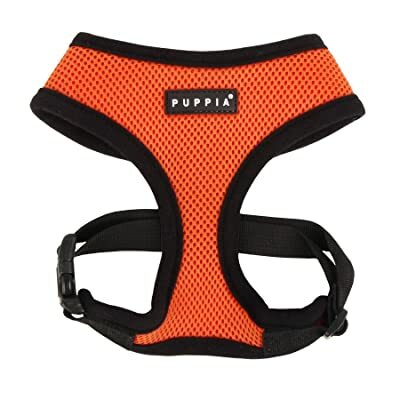 The PUPTECK harness is made keeping in mind the safety and comfort of your small dog. Having a very classic and stylish design with a pattern of pleading, it is made from 100% polyester as well as a soft air-mesh breathable fabric. The product dimensions are 5 x 5 x 1 inch. 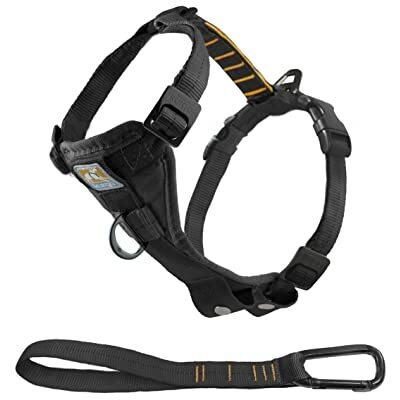 Furthermore, this harness is extremely light-weight weighing only 1.6 ounces. You have the option to decide from various colors and designs. Moreover, it comes with an adjustable comfy chest belt and quick release buckles for your convenience. Also a D- ring to hook every regular leash is there on the back of the harness. This soft mesh harness is available in 5 different sizes ranging from X-small to X-large. All in all, this is a very safe choice for your small dog as the strap and buckles are tested to provide the fastener strap with extra security. Having a vest style design, it doesn’t hurt your dog while running or hiking. 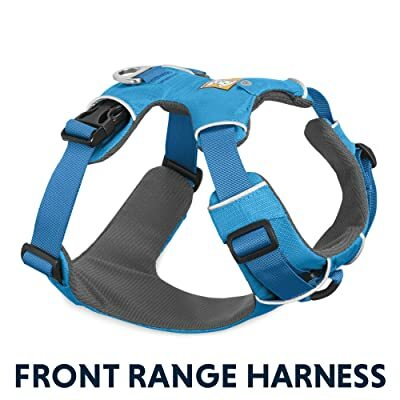 This harness by Comfort Fit Metric is the most comfortable dog harness in the market for small dogs. Firstly, it is made from metric 66 materials that make it extremely comfortable for your dog by ensuring a snug fit and reducing the strain and tension. Secondly, this harness is interiorly all padded with great extra cushioning for your dog’s comfort. This light-weight harness weighs only 1.4 ounces. Furthermore, it comes with an extra long Velcro strap for better adjustment having quick release clip for easy put on and removal. The presence of 2 D-rings securely locks on your leash. In addition, it is available in 4 different sizes and 6 colors. Lastly, the harness is made from breathable and washable material providing extra comfort to your small dog. Perhaps the most important thing you should ensure before buying a harness is the correct size and fit for your little one. Make sure that it’s not too tight or loose. A tight harness will make your dog uncomfortable and might also harm him. A loose harness will slip away and won’t give the right grip. Always match your dog’s size with size chart provided by the manufacturers. It is essential to know how to put on a harness correcting for a better fit. The following video is a great demonstration of how to measure and put on a dog harness. The next thing you need to look in a harness is the comfort. The harness should be made from high-quality materials that are comfortable for your small dog to wear even for long hours. Low-quality materials can cause itching to your small and are not comfortable to wear for extended hours. The most comfortable harnesses are made from polyester and cotton which provides comfort to your small dog. If properly designed, the nylon webbing can also provide enough comfort to your small dog. Look for the harness which is made from air-mesh breathable material to avoid chaffing. When talking about small dogs, how can you not look for safety features? The small dogs are very difficult to spot on roads and parks, so look for a harness design that has a reflective pattern, tape or logo. It is also beneficial for your small dog walking in low light conditions. Clips and buckles used in the harness of your small dog must be secure in order to prevent your dog from slipping freely. Connecting and disconnecting of the buckles and clips should be easy. Basically, there are 4 main types of harness for small dogs. This is the most common type of harness that distributes strain against the back and chest of your small dog protecting the neck area. The no-pull design requires your dog’s to fit in the harness properly. Your pet can feel the pressure on the front armpits of your pet. As the name suggests, this harness has a vest-like design. It is really comfortable to wear by dogs as the soft materials distribute the weight evenly throughout the body. This type of harness has a padded plate of support from the chest to the belly with a cushion to provide comfort. The harness is more effective than a collar for small dogs because the collar slips away from their little heads. A collar for small dogs is not easy to find but there is a wide range of sizes in harness. The X-small to medium might be the best fit for your little poodle or Yorkshire. It is an easy tool for training your puppy and also acts a fashionable walking aid. There is no physical harm to your small dog with wearing a harness. No choking issue that often occurs with collars leading to injury of neck and trachea. Harnesses lower the risk of such injuries. Dogs with breathing problems or neck injuries get a great benefit from harnesses as pulling a collar causes coughing. Harness provides better grip and control over your small dog. It prevents your little dog from jumping on someone and gives you full control of your dog without even pulling. The pressure is not just on the fragile neck of your little buddy; the harness distributes and reduces the pressure evenly throughout the body. Harness spreads the strain over a wider area. It also prevents entangling of the leash. A puppy wearing a harness cannot tangle himself or you as you can attach the leash to the harness’s back. Some harnesses made out of high-quality materials also keep your dogs warm in cold conditions. They also make car traveling easy when attached with a seatbelt. Having a reflective design on harness makes it easy to spot small dogs surrounded by people on roads. So, if you are the owner of a puppy then buying a harness is the best option for you and your small dog. A harness is totally safe for walking and makes the training process of your little dog much easier. However, our top pick is the Front-range all-day adventure harness for dogs by RUFFWEAR. It is very convenient for you to put on and remove with easy quick-release buckles and 4 point adjustment features. The Front Range harness includes high-quality durable materials that provide extreme comfort to your pet with a soft belly and chest padding. The unique and most feature of this harness is the ID pocket. Your pet will always carry its identity with himself. Therefore, don’t waste any time and start training your little dog with this perfect harness.